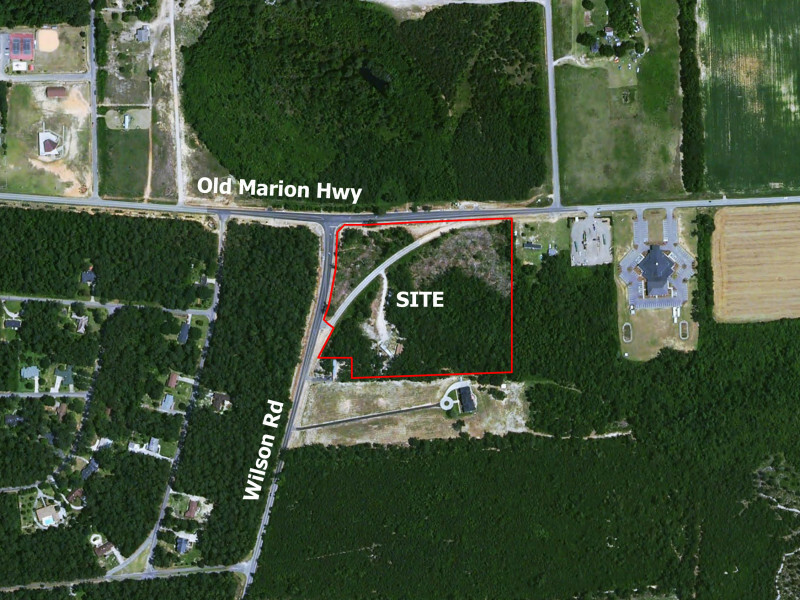 Available is an excellent commercial development tract located at the corner of Old Marion Highway and Wilson Road. This section of Old Marion Highway connects TV Road and US Highway 327, which provide access to two exits off Interstate 95, less than 4 miles from the site. The site is also located approximately 1mile east of the 1.4 million SF QVC Distribution Facility. The area is home to Wilson High School, less than a mile away, Byrnes Academy, located diagonally across the street, the neighborhoods of Quinby, and the well known Country Club of South Carolina. The site is approximately 13.09 acres and includes the abandoned portion of the former Wilson Road connection. The site has approximately 740 feet of frontage on Old Marion Highway and about 540 feet fronting Wilson Road. The site is situated just outside the town limits of Quinby and is not zoned. City water and City sewer are near the site. The owner will consider subdivision of the property.